A young street urchin, one of the Baker Street Irregulars, discovers a man’s belt and buckle under a bush in Hyde Park. He brings it to Sherlock Holmes, hoping for a reward. The buckle is unique and stunning, gleaming turquoise stones set in exquisitely carved silver; a masterpiece from the native American west. A body of an American Indian is found in a hotel room in Mayfair. Scotland Yard seeks the help of Sherlock Holmes in solving the murder. The victim is the brilliant artist that created and wore the buckle. 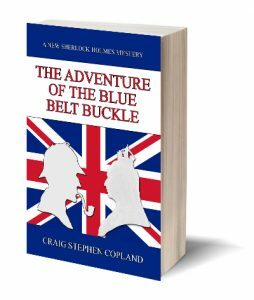 A secret key is found leading Sherlock Holmes to a replica set of the Crown Jewels. The real Jewels, supposedly secure inside the Tower of London are in danger of being stolen or destroyed. The Queen’s Diamond Jubilee, to be held in just a few months, could be ruined. Sherlock Holmes, Dr. Watson, Scotland Yard, the Home Office and even Her Majesty all team up to prevent a crime of unspeakable dimensions.